Pearl Harbor is perhaps the most well known naval base in the world, providing a deep-water harbor and headquarters for the Navy's Pacific fleet. On December 7th, 1941 the United States naval base at Pearl Harbor was attacked by the Imperial Japanese Navy Air Service in an attempt to stop the Pacific fleet from interfering with Japan's military presence in Southeast Asia. Waves of Japanese fighter planes damaged all eight battleships in the harbor, sinking four and killing over 2,000 Americans in the surprise attack. The attack came as a shock to the American people and marked the United States' entry into World War II. The Pearl Harbor Historic Sites include the main museum and exhibits as well as the USS Bowfin submarine, the battleship Missouri Memorial, the USS Arizona Memorial, and the Pacific Aviation Museum. 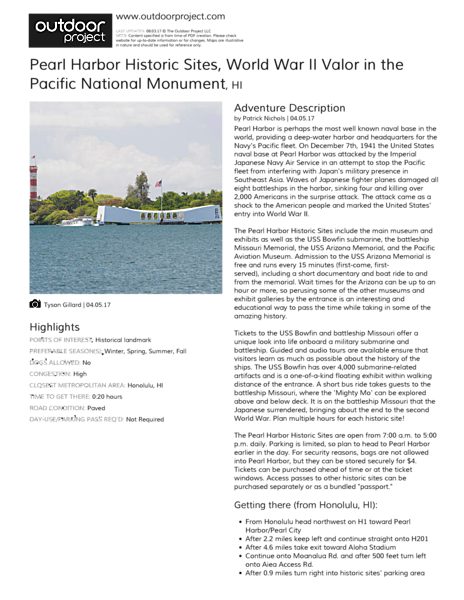 Admission to the USS Arizona Memorial is free and runs every 15 minutes (first-come, first-served), including a short documentary and boat ride to and from the memorial. Wait times for the Arizona can be up to an hour or more, so perusing some of the other museums and exhibit galleries by the entrance is an interesting and educational way to pass the time while taking in some of the amazing history. Tickets to the USS Bowfin and battleship Missouri offer a unique look into life onboard a military submarine and battleship. Guided and audio tours are available ensure that visitors learn as much as possible about the history of the ships. The USS Bowfin has over 4,000 submarine-related artifacts and is a one-of-a-kind floating exhibit within walking distance of the entrance. A short bus ride takes guests to the battleship Missouri, where the 'Mighty Mo' can be explored above and below deck. It is on the battleship Missouri that the Japanese surrendered, bringing about the end to the second World War. Plan multiple hours for each historic site! The Pearl Harbor Historic Sites are open from 7:00 a.m. to 5:00 p.m. daily. Parking is limited, so plan to head to Pearl Harbor earlier in the day. For security reasons, bags are not allowed into Pearl Harbor, but they can be stored securely for $4. Tickets can be purchased ahead of time or at the ticket windows. Access passes to other historic sites can be purchased separately or as a bundled "passport." USS Arizona Memorial. Battleship Missouri and USS Bowfin Submarine Museum. Very limited parking. Multi-hour wait is common for the USS Arizona Memorial.